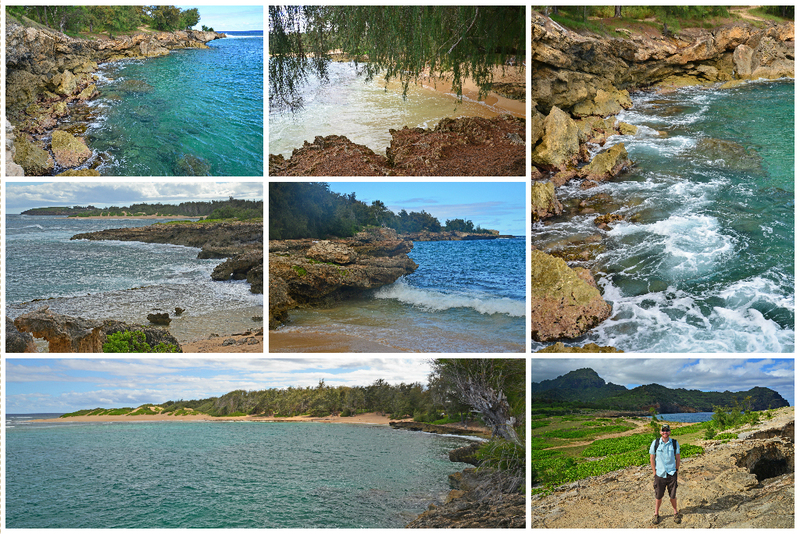 We visited many beautiful places on the island of Kauai. 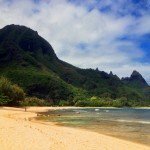 If your heading to the Garden Isle of Hawaii, check out our list of the three we thought were the most memorable (listed in no particular order). 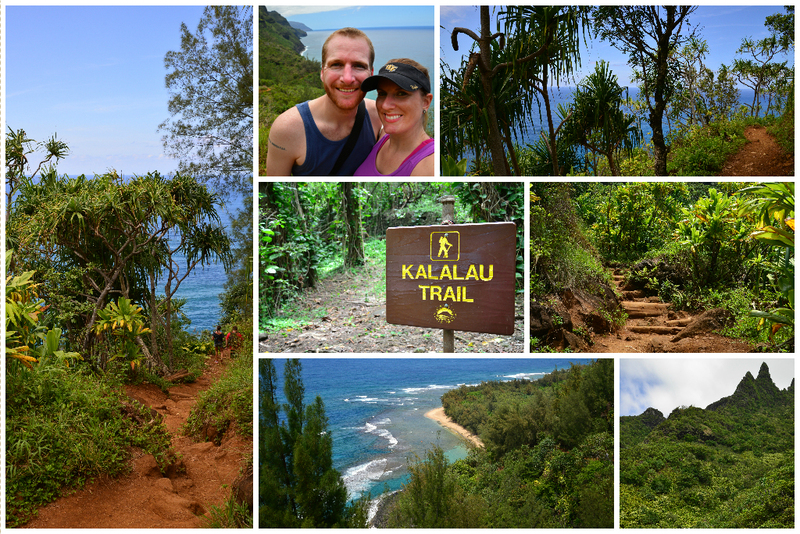 Kalalau Trail is one of the best hikes in Kauai. We attempted to find parking at Ke’e Beach, which is where the trailhead for the Kalalau Trail starts. That lot was full, so we ended up parking at a pot-hole-and-rock-filled parking lot a few hundred yards down. (Tip: Arrive early and get a good parking spot!) The hike starts with a pretty steep incline that gets your heart racing! You climb pretty high pretty quickly, so within the first quarter mile, you are overlooking beautiful Ke’e Beach. (To read our post about the best beaches in Kauai, click here.) The water was so clear! We could see the reefs below and could even see turtles swimming! The hiking trail evened out a little, but there were still a few steep parts. Eventually, we had views of the Na Pali coastline, which made for incredible pictures! 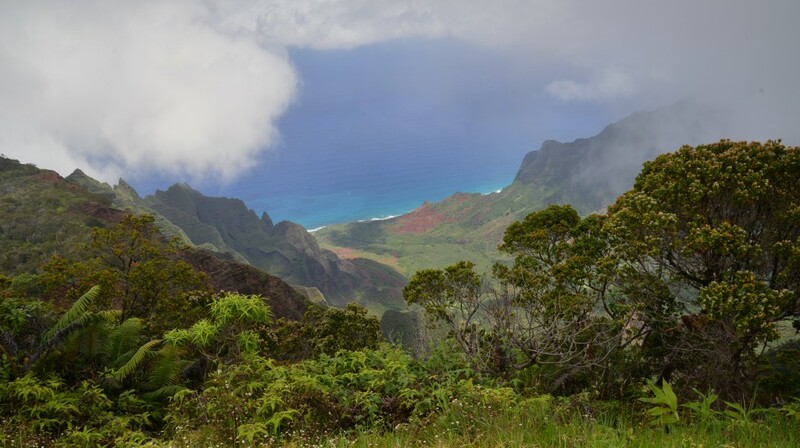 The first 2 miles of the Kalalau Trail is the most popular hike on the island. After the two-mile mark, hikers have to have a permit to continue on. We had hoped to do the entire two miles, but decided to turn back at about the one mile mark and head to the beach! Renting a car is essential for your time on Kauai. Without your own wheels, it may be a little difficult getting to and from these gorgeous places! We found a great deal on a convertible with Hertz. Little did we know, we’d have to drive down a pot-hole-filled 2.5 mile dirt road to get to this hidden gem! We were actually in search of tidepools at Mahaulepu Beach when we stumbled across what ended upon being one of our favorites places on the entire island! It was pretty windy out on the beach, so we decided to head back and see what else we could find. We drove the car a little down another road leading off the parking lot and hit a gold mine! There was a trail that ran along the coast, passing cliffs and rocks leading to the crystal clear water below. Funny Story: Since we thought we were just going to another beach to look quickly at tide pools and didn’t really know what we were getting ourselves into with the long-drive down the dirt road, we both really had to pee. I thought I could hold it, but as the landscape kept getting more and more beautiful as we walked, I didn’t want to just turn around and leave. Obviously Sam had it a little easier, but we both stopped and took turns peeing in the bushes, while the other person served as the lookout. Fortunately, there weren’t too many other travelers along this path and luckily I was wearing a skirt! Hey, when you gotta go, you gotta go! We got to one point on the trail, where we felt like we had been transported to Ireland! There were green mountains and beautiful coastal cliffs culminating into crashing waves below. It couldn’t get more beautiful and scenic than this! And the best part is that we only saw four or five other people the whole time! On the way to Waimea Canyon, we stopped to take pictures of the beautiful valley at the Hanapepe Overlook and finished the nearly 2 hour drive from Princeville. Tip for future travelers to Waimea Canyon: regardless of what your GPS says, turn off at Waimea Canyon Road (Highway 550), NOT Kokee Road. The views are much better! There were so many scenic views from the road. 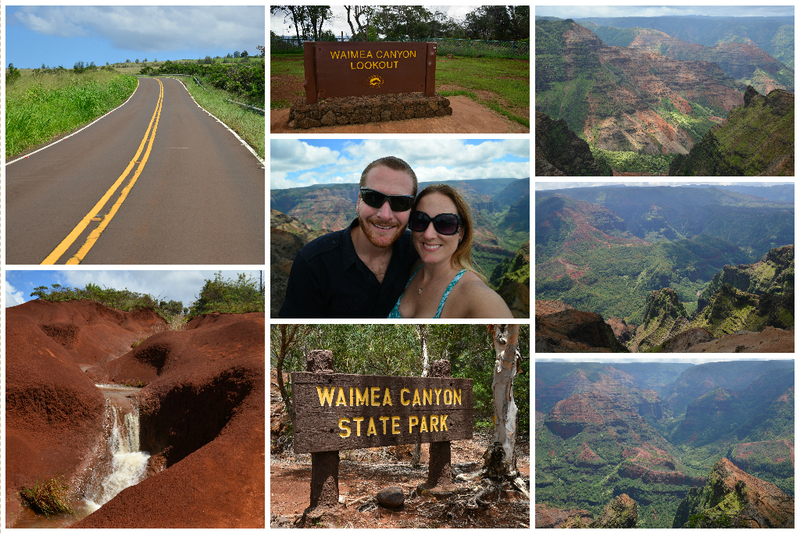 We probably pulled over at least 7 times before reaching the Waimea Canyon Lookout just after the 10-mile marker. This place is appropriately nicknamed the ‘Grand Canyon of the Pacific’, and I truly did feel as if we were back at the Grand Canyon in Arizona! The views were absolutely breathtaking! We set up our GoPro to take a time lapse video while we took our obligatory tourist pictures in front of the canyon. We continued on down the road to the very end (18-mile marker) to the Kalalau Lookout. We were getting nervous as we were reaching the end of the road, because as the elevation climbed to 4,000 feet, not only did the temperature drop, but the ever-present clouds rolled in! When we finally reached the lookout, you could barely see the Na Pali coast below. Just as we walked up to the ridge, there was a small clearing in the clouds and I snapped a few pictures before the clouds completely covered the vista. We sat on the ground and waited for a good 25 minutes before leaving. The clouds never did clear again, but we were getting hungry, so I forced myself to be satisfied with the pictures I snapped when we first got there and were on our way! This post contains affiliate links. If you make a booking after clicking on one of these links, we may receive a small commission at no extra cost to you. Seriously beautiful photos! 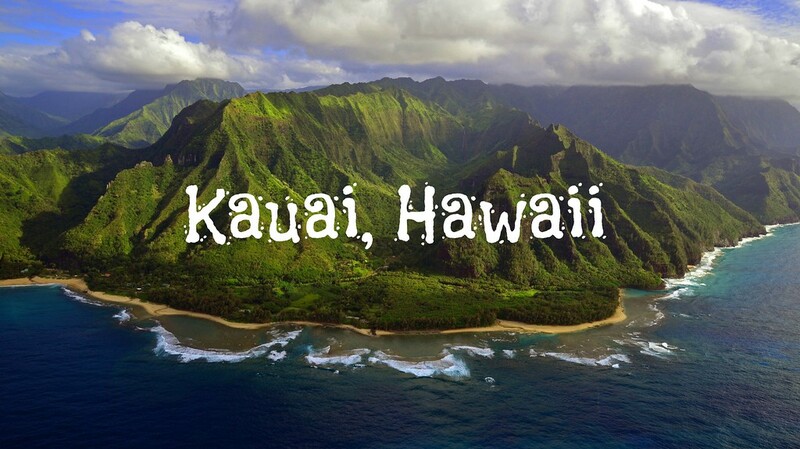 I would love to get to Kauai – we’ve been to Maui but nowhere else, so I think a return trip in in store. And major lol to your sory about nature’s call – we always travel with toilet paper on our hikes for that exact same reason! Wow…amazing photos and breathtaking views! So many places to explore beyond the beach! I would love to go. What fantastic views. We love hiking and this would be the kind of trail we would seek out not only for the views but also for the tranquillity that would come with it. Beauty, tranquility… this island has it all! We were in Kauai for 2 weeks this past September. We hiked 2 miles back on the Kalalau Trail, to the beach. it was an awesome hike. We also drove to the Waimea Canyon lookout, we took one road up and the other one down so we had different views. I think we stopped at every lookout. It was beautiful. Another must do is the Mauna Loa Helicopter tour. They are small helicopters and we did it with the doors off. What an experience that was. 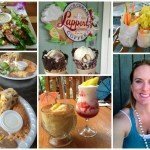 We would like to go back to Kauai…there is so much we still want to see and do. Sounds exactly like our week in Kauai! Such an amazing island with so much to explore and discover! 🙂 We’d love to go back again someday as well! We are so excited to vacation there in October this year! Great post and the pictures are stunning. I cannot read enough about Hawaii. Thanks for sharing…. Hi Sonya. Hope you have a wonderful time in Kauai! October should be a quiet time to visit. It is beautiful there and I do hope the island and its people can recover quickly from the flooding and devastation that recently occurred there. The flooding took place in April (2018) and recovery efforts were quickly made to restore Kauai back to its original beauty; though there is still work to be done. North Shore from Hanalei to Haena, sustained the brunt of property damage. 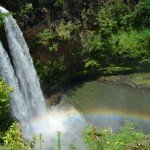 For updates on the impact of the floods: https://www.gohawaii.com/islands/kauai.